I’ve not been at home much lately, which makes it difficult to maintain a regular blog, and this week we’re running a painting course in Mid Wales. The beautiful sunshine on the last two days made excellent light for sketching outdoors, although it has been a little on the cold side. The weather forecast told us that it was going to be quite different from this, which makes us rather sceptical about their forecasts of doom for our planet. Now and then I rather like to put a little ‘doom’ into a painting, often a sense of impending horribleness as in this watercolour of Grassholm Island off the Pembrokeshire coast. 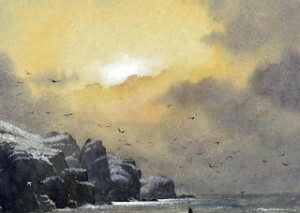 Its northern cliffs are mainly black and dire, with the great contrast of white gannets and gannet guano in spring, so to achieve a dramatic effect I have painted it mainly as a monchrome using indigo, but injecting some colour in the form of cadmium orange in the sky. Because I’ve painted this on a biscuit-coloured tinted paper I had to add the highlights with white gouache. There are many gannets in the sky and on the crags. As I’ve mentioned before, carrying out a monochrome is an excellent way of learning to apply watercolour without the problem of colour mixing, but when you add a further colour like this it will take you one stage further and possibly increase the drama. Dark, moody paintings like this can convey a striking sense of mystery, so don’t be afraid to apply some really strong darks in your watercolours. This entry was posted in atmosphere, David Bellamy, Monochrome painting, watercolour, Watercolour on tinted paper by David Bellamy. Bookmark the permalink.